Today I want to share one of my favorite recipes with you! 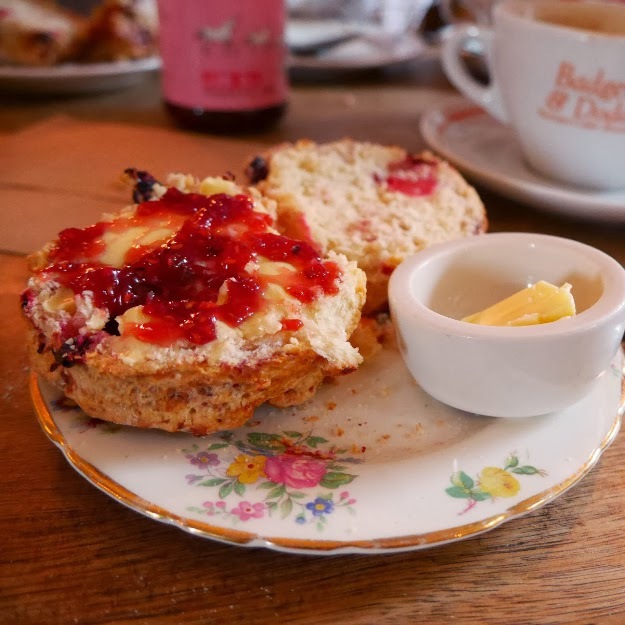 I have been craving scones lately, I don't know if it's because they remind me of an adorable cafe that I visited while in Ireland or that they are flat out delicious!? This recipe is amazing, light flakey and moist it's delicious with a capuccino or a cup of tea! 1. Preheat oven to 425. 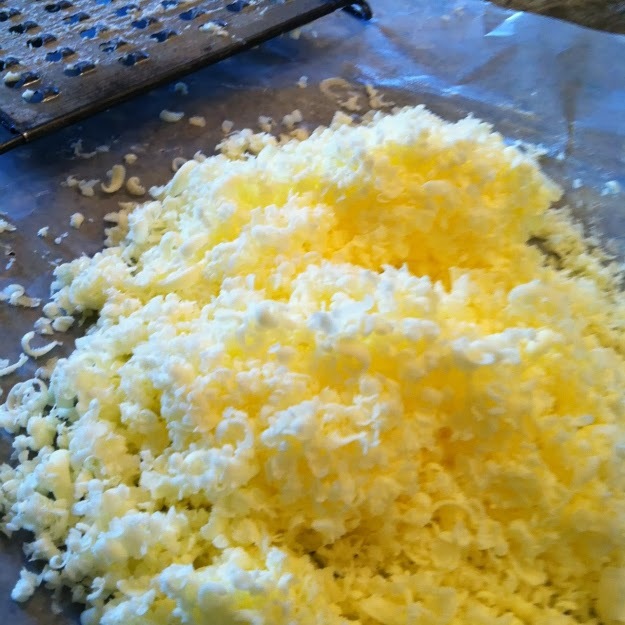 Grate frozen butter with a cheese grater and place in the freezer while you prepare the wet and dry ingredients. Melt 2 T of butter and set aside. 2. Whisk the milk and sour cream together in a bowl and place in the fridge. 3. Mix flour, sugar, baking powder, soda, salt and lemon zest together in a large bowl. 4. Toss frozen grated butter into flour mixture and add the milk mixture to a well in the center of the flour butter mixture. This part can get messy I usually end up using my hands. 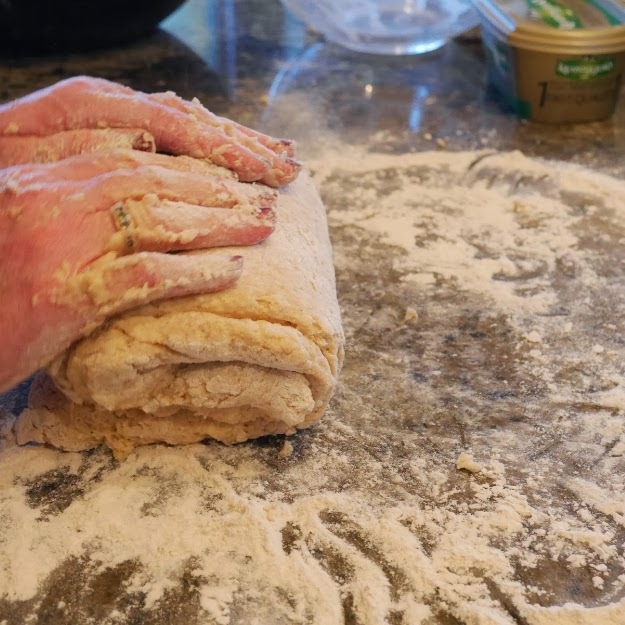 Put the dough out unto a floured counter and roll the dough into a 12X12in square. Fold into thirds like a business letter and thirds again the opposite direction to form a 4 in square. 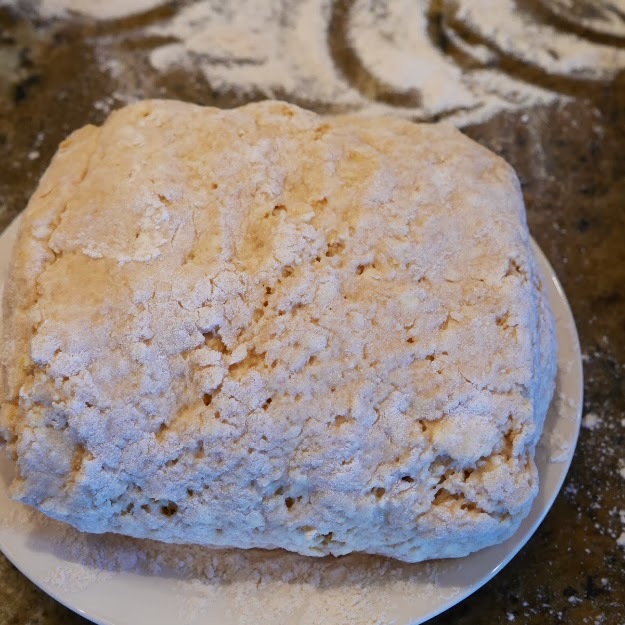 Place the dough unto a lightly floured plate and chill in freezer for 5 min. 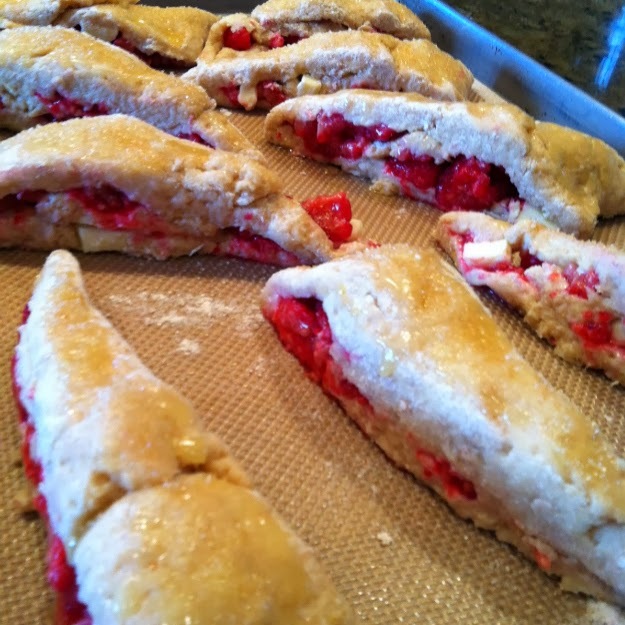 Try not to handle the dough too much or the butter will start to melt. It will be a rough sticky dough. 5. 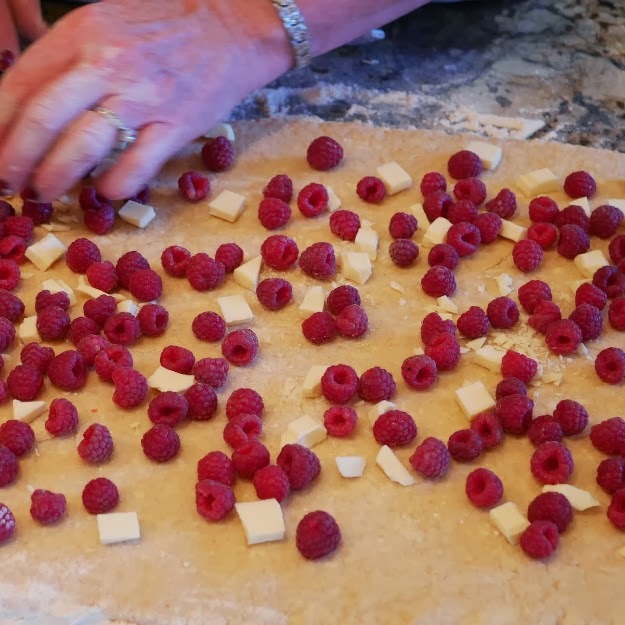 Forming your scones and adding the filling:) Place dough unto the floured counter again, roll it into a 12 X 12 in square again and sprinkle the raspberries and white chocolate on the dough. I press the filling into the dough. Then fold the dough into thirds like a business letter again so that is forms an approximate 12 X 4 in log. 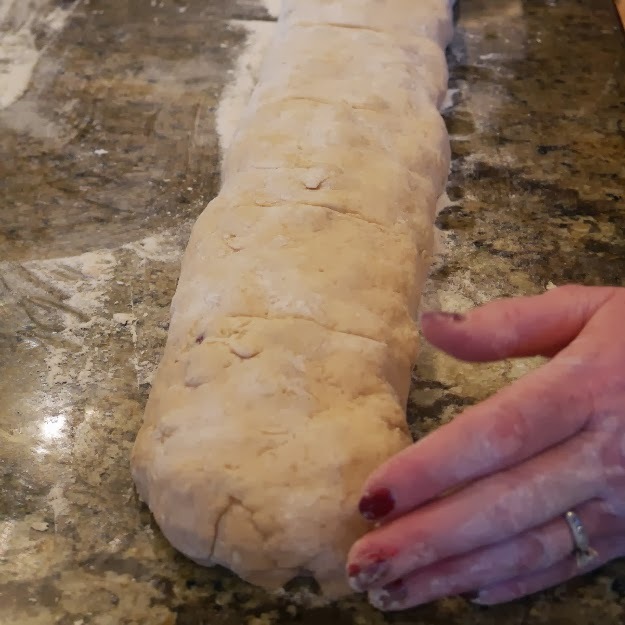 A bench scraper can be helpful at this point if the dough is sticking. Using a sharp floured knife cut the log crosswise into approximately 6 - 7 equal rectangles, then cut the rectangles diagonally to form two triangles. Place on a parchment lined baking sheet. 6. Brush melted butter on the scones and sprinkle with vanilla sugar. Bake for 18 to 25 min. The tops and bottoms should be golden. I love this recipe because you can also make them ahead and refrigerate them overnight or make a double batch and put half of them in the freezer! For freezing: after brushing with butter and sprinkling with sugar place them in an air tight container and place in the freezer! 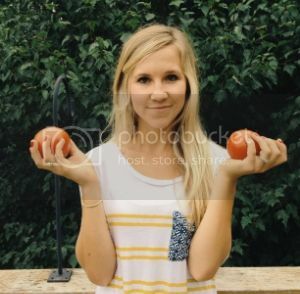 Another nice thing is that you can make them with any fruit you want! I have also used blueberries. I think that I want to try plain and top with butter and jelly! YUM! 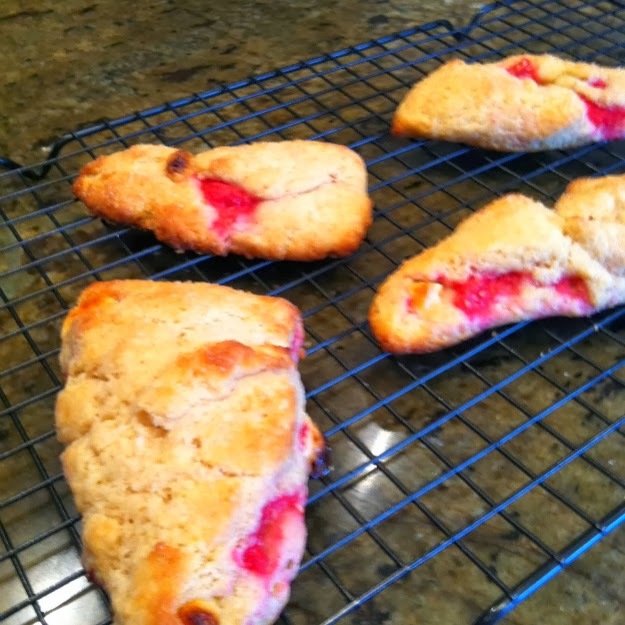 Baking instructions for frozen scones: preheat oven to 325 and extend baking time to 25 to 30 min. You don't have to let them thaw. Thanks again Heather! Thank you so much for reading and I really hope to meet some new lovely bloggers! Stop over and say hello at Topaz n Pearls!